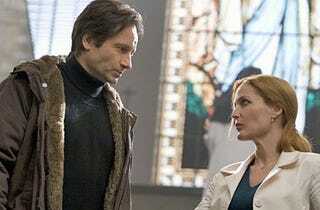 At yesterday's X-Files 2 panel at New York Comic-Con, creators Chris Carter and Frank Spotnitz were customarily tight-lipped about the movie's storyline. But they did drop a few new hints — and io9 managed to ask them the one question you told us was burning in your minds: have Mulder and Scully been in touch during the past six years, or does the movie see them reunited for the first time since the show? Their answer, plus where Skinner might be, after the jump. io9's intrepid intern Nivair H. Gabriel was one of the first to jump up and into the question line. When she asked Carter and Spotnitz whether Mulder and Scully had been communicating with one another during the six years that elapse between the series and the movie. Carter's good-natured, ever-elusive response? "Well," he answered coyly, "they've been texting." They showed the same trailer we already featured at io9 a couple of weeks ago. As we've heard before, it's a stand-alone story, without the government conspiracy/UFO mythos that made up a large bulk of the show's plot arc. The movie also provided a chance to get personal with the characters of Mulder and Sculy in a way the series never could, Spotnitz and Carter said. They're hoping this will only help move X-Files into the future and didn't rule out additional projects. One sort-of straight answer, at least: no, Scully's family, an emotionally wrought subject for her on TV, won't be appearing in the film. Carter was squirrelly, though: that doesn't mean we'll never see "references" to them again. Carter says that the X-Files is, and has been, not about aliens, but about other people. Spotnitz is happy to hand over full credit to Carter for the movie's title, "I Want To Believe"
No word on extra or cut footage, but we're promised that a future Blu-Ray will be "very cool"
A question comes about the political climate today. Mysteriously, we're told that while the X-Files movie isn't political, it feels like it's taking place "right now." "We live in scary times," Carter adds, tracing his own initiation into paranoia to the Watergate era and suggesting that we look to what our own government is up to more often. What should we take away from the movie? Spotnitz: Hope. Carter: The trash from under your seat. Carter and Spotnitz have generously extended the Q&A several times to accomodate a long line of fan questions. Any actual information about the film's plot or the characters included are mostly skirted, though Amanda Peet and Xzibit are reconfirmed as playing FBI agents, and Billy Connolly, noted as an excellent comedian, will be very much "not funny" in "I Want to Believe." Carter neglected to mention sci fi favorite Callum Keith Rennie's inclusion, which likely would have brought cheers from some of the gathered fangirls/boys. A Q comes about whether the men have seen fan efforts online. Carter congenially responds that while it's appreciated, "that stuff is waaaay too racy" but he appreciates that "people are living much more hot and racy lives than I am" and using his characters for a medium. While Iappreciate Carter saying so, that's quite a change in tune from from the years when 20th Century Fox lawyers used to hound the websites of small X-Files fanfic websites with cease-and-desist letters. A fan asks: was Carter inspired at all by the late Arthur C. Clarke? Yes, Carter answers, without having to think about it: he was inspired by Clarke's uncanny way of predicting the future. Some old series issues wrapped up: by the 7th season Mulder has accepted that his sister Samantha is dead, and Mulder is, indeed, the father of Scully's baby, which I'm sure I wrote a story about once. No love for Mitch Pileggi as FBI boss Skinner? Carter joked that Skinner was surely a part of the excised steamy love scene Gillian Anderson and David Duchovny had talked about shooting together in order to mess with our fragile fan brains.